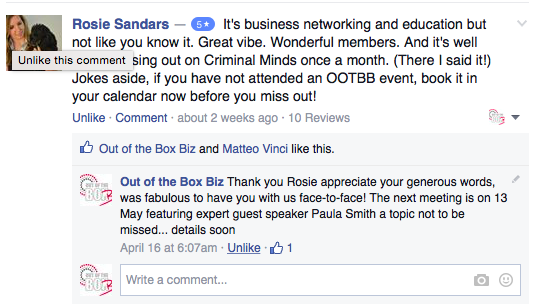 Thanks for the opportunity to attend your Networking workshop last Thursday. I found the information on how to use LinkedIn for lead generation most helpful and look forward to applying it next time someone asks to connect. Having listened to a number of webinars on networking, I personally found the pace of pre-LinkedIn sections a little slow – due as I say, to the fact that I was already familiar with most of the information. This is no reflection on you but something that will always occur when you have participants with different levels of knowledge and experience. Thank you so much for taking the time to speak with us at your workshop. The information and experiences you shared provided a great insight. I especially appreciated and took away the importance in using LinkedIn and how a social media presence must be treated the same as if i were to meet someone face-to-face. Your workshop also got me thinking about how we could be helping the people closest to us; and who is on my wish list. This is something that I hadn’t yet considered, but it is something that I am looking into as I find my feet more in this new role. I have worked with Fleur Allen for the past 6 years and during that time I have constantly been amazed by Fleur’s passion and commitment to the arts. 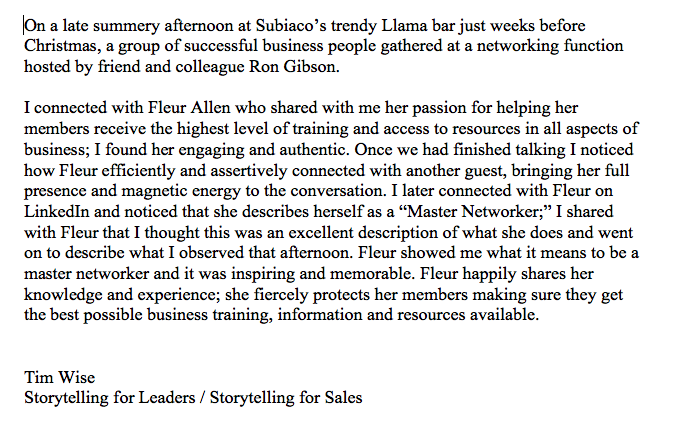 The reason I continue to build my business with Fleur is her vision and energy to make things happen. Her professional approach to everything she does along with her courage to adapt to change means that Fleur is always on the cutting edge. 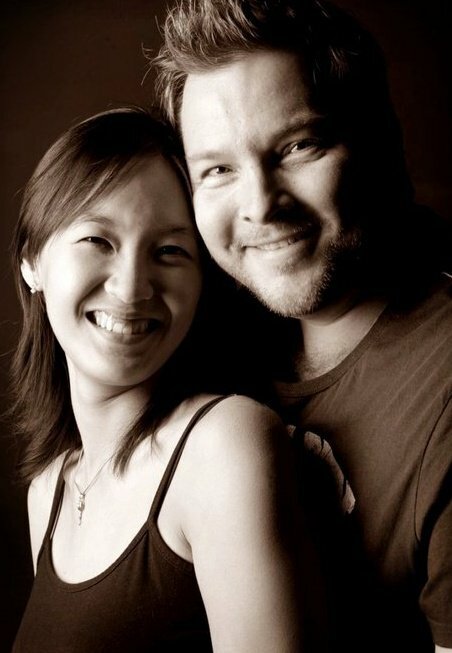 Fleur has provided me with many opportunities to raise my profile and is an avid networker. She Ioves people and listens to their needs, resulting in successful business relationships. 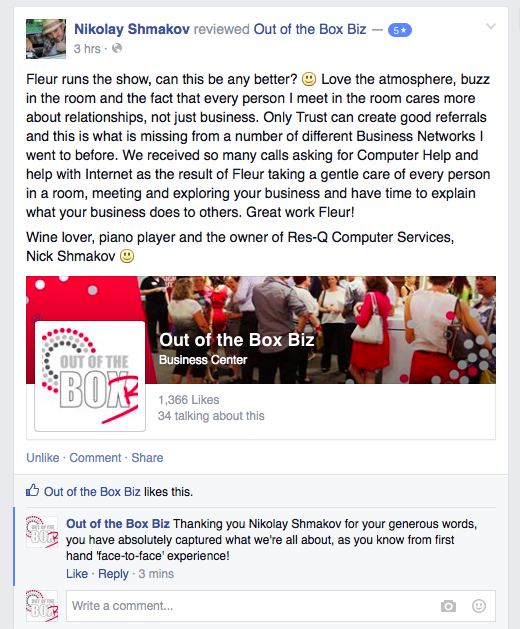 I look forward to continuing the journey with Fleur, through Out of the Box Biz. from your seminar. We going to talk about it to people we know. I so enjoyed attending your property seminar as you spoke in language that I could understand and I saw where you started and where you are now, and knew that it is possible to achieve a property portfolio. Your seminar made an impact now’s the time to take action. Thank you so much for your seminar on Saturday. I am quite envious of how in-the-know you are about real estate. I am interested in your follow-up workshop too. Again, thank you. What you do is unique and certainly for us a very helpful first step. I attended a workshop in 2011 facilitated by Fleur when she shared her extensive knowledge on how to achieve results through property investment. The experience was enjoyable and very educational and I look forward to working with Fleur as one of our guest speakers in 2012 . Fleur is very inspirational and passionate about helping others find profitable ways to achieve their goals. Fleur is definitely a leader rather than a follower, someone who thinks outside the square. She is naturally creative with a positive attitude and works hard to provide great value to her customers. Fleur is extremely passionate about educating and helping people fulfill their purpose through property. I attended Fleur’s Property with Purpose seminar last year and whilst my fiance and I already own property, I found it very useful. I’d recommend Fleur’s seminar regardless of whether you are just entering the property market or if you’ve held a property or properties for some time. I attended one of Fleur Allen’s Property with Purpose seminars, and found her to be an excellent presenter, well spoken with good content and knowledge of the topics she spoke on. I would not hesitate someone to attend who needed a good knowledge of picking real estate best suited for the individual. 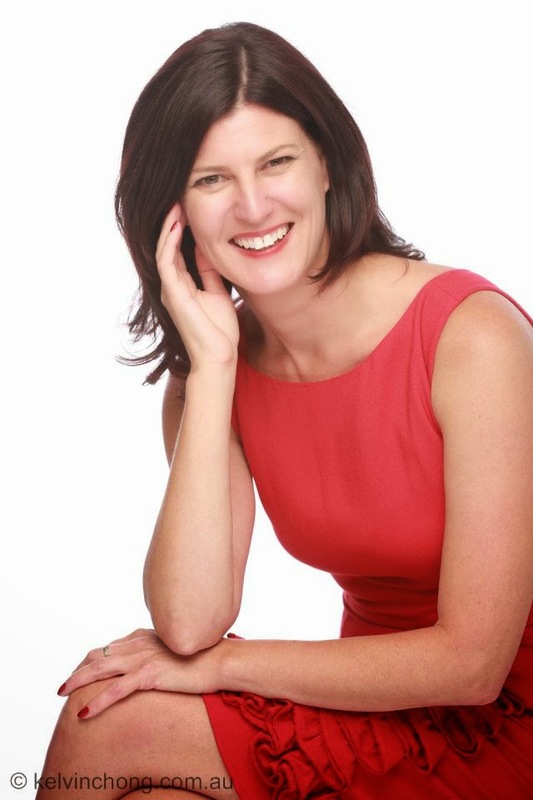 Fleur is an entertaining speaker and presenter with an informal syle. She has genuine passion for her business of investing in property with purpose and conveys it in a way that people can understand easily. Fleur will take you a step closer to your ideal home or property portfolio. She is a wonderful Property Mentor – she teaches you how to do it properly – she does NOT sell real estate. Fleur Allen has been a great inspiration for myself and my partner Renee in making us believe that we can achieve our goals from investing in the property market. The Property With Purpose x3 seminar was full of great information and helpful tips that give everyday people the confidence to go ahead and Invest in their first property or buy their first home. Fleur has a very positive outlook on investing and is always willing to help with questions you may have. I look forward to staying in touch with her as I begin learning more about property and Investing in the market. I’ve been to a seminar of yours before you’re a fab speaker! Fleur is passionate about helping people realise their property goals.